The US refuses to issue a Visa for Hamid Aboutalebi, Irans newly appointed ambassador to the UN. Mr. Aboutalebi is considered a „security risk“. „The US accuses Hamid Aboutalebi of links to the group that seized the US embassy in Tehran in 1979, an incident that soured ties between the countries. He has been wrongfully portrayed as one of the hostage takers. Apparently those countries did not feel their security at risk due to Mr. Aboutalebis presence. This is yet another act of american double standard given that the US assigned former CIA director Richard Helms as ambassador to Iran from 1973-1977. The source for the Lockerbie claim is the same dubious person: Abolghasem Mesbahi. The article calls Mesbahi a „witness by profession“, who has been behind some of the wildest anti-Iranian claims: Not only did Mesbahi accused Iran of being behind Lockerbie and the Buenos Aires bombing. He even blamed Iran for being involved in the 9/11 attacks. b) The Syrian army needs every single bullet right now. 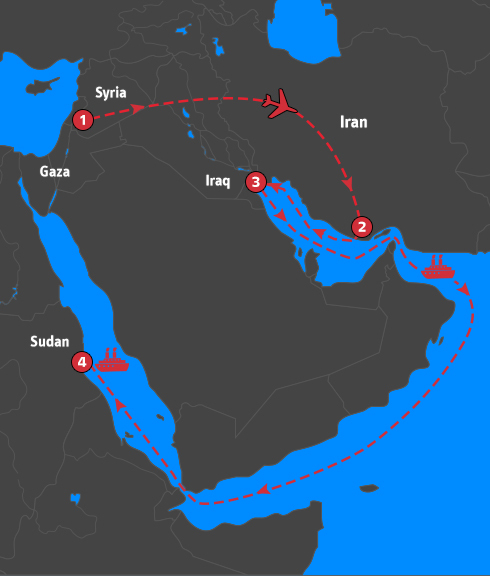 Why does not Iran export own rockets to Hamas and instead reduces Syrias bitterly needed arsenal? c) Syrias relationship with Hamas is at an all time low. Why should they help arm Hamas right now? e) How was the alleged Iranian weapons shipment supposed to break through the Israeli maritime blockade of Gazas coast when even aid flotillas are not passed through? i) Why are the cement bags labelled „Made in I.R. Iran“ in English letters but without any Farsi/Arabic script? Is Iran now a proud exporter of cement to non-middle-eastern countries?